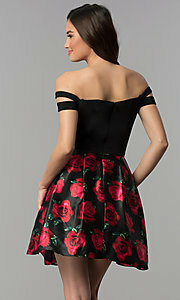 Unfortunately, the dress you are looking for (Style: BN-493BN, Name: BN-493BN) is no longer available. 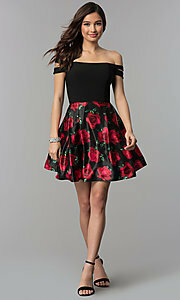 Chic and romantic, this short off-the-shoulder homecoming dress is ideal for showcasing your love for fashion. A trendy off-the-shoulder neckline brings modern fashion to life as the double banded sleeves on the black jersey bodice take the appeal to the next level. 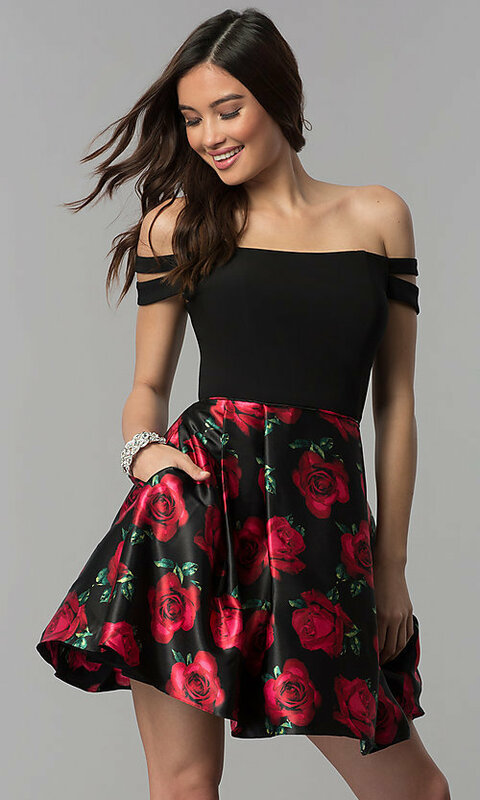 From the designers at Blondie Nites, this short semi-formal party dress boasts a floral-print satin skirt that creates an irresistible look for hoco 2019, a family celebration, or another semi-formal occasion. The bold red floral print pops against the black background, and a tulle-trimmed jersey lining provides soft comfortable coverage on the box-pleated skirt with convenient side pockets. For a fun, flirty, and youthful vibe, slip into this lovely short off-the-shoulder homecoming dress and dance the night away.